It’s the holiday season and for many in New Orleans, that means love is in the air. 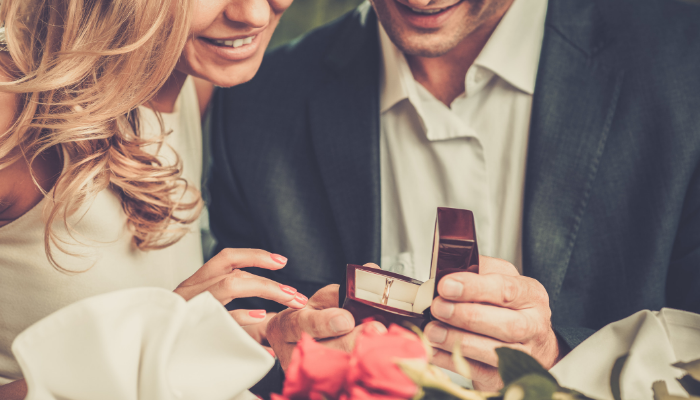 If you’re planning to pop the question to your special someone, a little extra planning can make that moment spectacular. Whether you’re planning a night out at Commander’s Palace or a stroll through Celebration in the Oaks at City Park, New Orleans has some beautiful holiday locations to get engaged. Why not make that moment even more special with a customized, elegant limousine service? Imagine it. You pull up to the house in a long stretch white limo. You’re eager to show your love that you are ready to take that next big step and get married. This is the dream start of a perfect proposal. At Royal Coach Limousine, we have an impressive fleet of vehicles you can rent to make your proposal even more extravagant and romantic. You can reserve a VIP ride in advance to make this a night that will be etched in your memories forever. What is the VIP Experience at Royal Coach Limousine? At Royal Coach Limousine, we know how important this moment means to you and to beginning your new life together. That’s why we want to make your engagement the best evening of your life. We offer a VIP Transportation Service that is perfect for this once in a lifetime moment. With Royal Coach Limousine, we guarantee complete professional discretion and dependability you can count on. Our Chauffeurs are some of the best in New Orleans and it shows. That is why so many couples choose Royal Coach Limousine for all their engagement and wedding needs. In New Orleans, the holidays are a little extra magical. The city lights up with festivals, concert series, light shows, and incredible holiday cuisine. You can reserve a table at a 5-star restaurant and take part in some Christmas cocktails or bundle up and take a walk through the romantic City Park prior to popping the question. These are just a few of our favorite engagement spots in New Orleans but remember – anything goes in the Big Easy during the holidays. So, use a little creativity and imagination and your day will be one you talk about forever. Why Choose Royal Coach for Your Engagement? We know you have many choices when it comes to picking a limousine company. But did you know that Royal Coach Limousine is the top-rated limousine company on the Northshore from Mandeville, Covington, Slidell & Hammond? We are proud to be a part of your special day and we are proud to serve all the greater New Orleans metro area so much that we’ve got a special offer just for you! Those that choose us for their wedding proposal transportation needs will get 10% off of on their wedding day transportation with Royal Coach Limousine! You only get one chance to make the perfect proposal. At Royal Crown, we can help make all of your dreams come true with the perfect limousine rental. Contact us or call us today at (985)875-0723 and we can help you plan a day you’ll never forget.